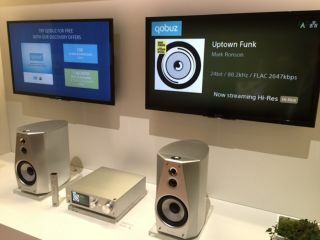 Qobuz Sublime hi-res streaming coming soon to select Sony products | What Hi-Fi? Qobuz Sublime, which includes high-resolution streaming through Android smartphones and iOS devices, is launching on select Sony products in the not too distant future. Tucked away in a corner of the IFA show floor, Sony had one of its HAP-S1 music streamers on display. The S1 is already on sale, but this particular system just so happened to be running Qobuz Sublime and streaming high-resolution music. The full-fat, hi-res part of the Qobuz Sublime subscription tier is already available through Android smartphones and LINN streamers, as well as on iOS devices connected to an external DAC, while the company has also recently announced support for other manufacturers including Samsung and Bluesound. Sony confirmed that it wasn’t too far away from releasing a firmware update that would bring Sublime to a number of audio products, including the S1 and, potentially, the high-end HAP-Z1ES music server. Sony even hinted that other product types might be able to benefit from Sublime's hi-res streaming feature further down the line. Maybe those new Walkmans?